Quality always comes first at Pro Chef Kitchen Tools and the Stainless Steel Soup Ladle is no exception to this cardinal rule. Quality begins with the stainless steel we choose to make our products with. Stainless steel is one of the most durable food-grade materials available: It won't rust, scratch or warp, which is why it's our go-to for crafting the best pro-grade kitchen tools on the market today. Quality is important, but so is functionality. The Stainless Steel Soup Ladle is designed to be just as useful for a commercial kitchen as it is for a home cook serving a large family. With that in mind, we crafted our Stainless Steel Soup Ladle with a large, deep cup end, so that serving large groups of people lots of tasty soup is simplified and time-efficient. Our ladle handle is long so that the handle won't get lost in your soup. Also, the extra-long handle prevents you from getting a painful steam burn, which is a common injury that can occur when trying to serve soup or stew with a ladle that's too small. Ladles can be a bit awkward to store; they're small on one end, big on the other and don't fit well in tight spaces. That's why the Pro Chef Kitchen Tools Stainless Steel Soup Ladle features a hanging hole integrated into the handle, so you can hang your ladle anywhere in your kitchen. Not only does this solve storage issues, but it also saves space in the process. Your family's health is important which is why the Stainless Steel Soup Ladle is made dishwasher safe. And because it's so durable, it can be washed with your other utensils for extra convenience. Looks matter when it comes to your home's appearance, and the kitchen is one of the most important rooms in the home. You should feel confident when showing your kitchen off to your guest, and your kitchen tools should be a part of that confidence boost. With the Stainless Steel Soup Ladle's modernly elegant look, you'll be happy to leave it on display when company calls. - Soup ladle has a long extended handle which makes mixing or pouring convenient. While making hot soups, stews, or pouring pancakes onto a griddle, hands must be kept at a safe distance. Fortunately, ladle measures over 14 inches long, creating a safer kitchen. Create favorite dishes with versatile stainless steel ladle. From morning breakfast to evening meals, everyone will love your food, and ladle will help make it happen! - Dishwasher friendly steel ladle makes cleaning simple. Place in dishwasher next to cups, plates, bowls, and silverware. Send soup ladle through the wash and it will be clean and shiny. No more need for hand-washing with this soup ladle. Give your home greater convenience by ordering a dishwasher-safe soup ladle. You'll spend fewer minutes cleaning and more time enjoying the food you make with this stainless steel ladle. - Wondering where to store kitchen items? Soup ladle comes with a hanging hole on the handle. Another detail that makes it a world-class steel ladle for any kitchen. Allows you to hang it in the kitchen, saving drawers for other utensils. Creates better storage for kitchens while allowing you easy access to soup ladle when needed. Lets you proudly display your soup ladle while saving space. 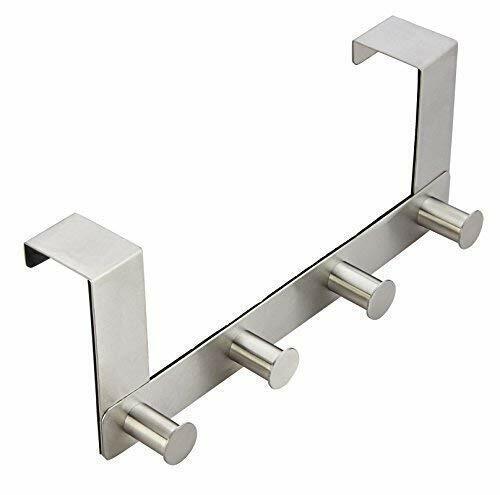 - Made from the highest-quality stainless steel to ensure long-lasting use and a clean, attractive finish. The premium-quality steel soup ladel is pleasing to the eye and gives your kitchen a small, gorgeous detail. 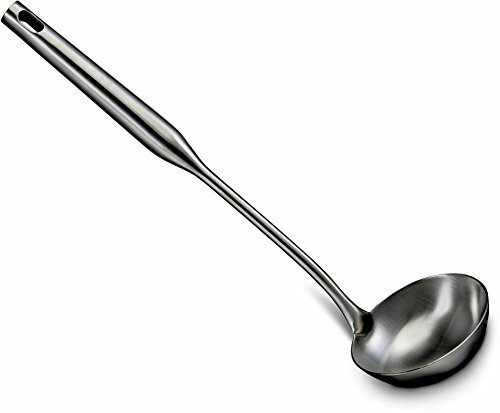 With durable and elegant stainless steel, soup ladle spoon can be used in commercial settings. 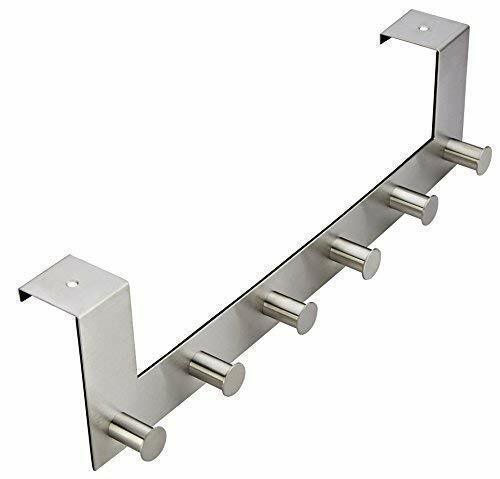 Makes a wonderful addition to a home or restaurant kitchen and will look great while staying strong for years. - Make cooking and pouring easy with this ladle spoon. The ladle handle on soup spoon is long while end is big enough for serving hearty portions of soups and stews. Make serving faster by having a steel ladle large enough to fill a bowl in only a couple of scoops. Hosting a large group? You'll be thankful to have a deep ladle with a full-size dipping spoon.